Will India's Next Light Fighter Be From Sweden? Will India choose Saab’s Gripen-E as its next light fighter? The report that Air Chief Marshal Arup Raha, India’s 61-year-old Air Force chief, capped a tour of Sweden with a flight in a Saab Gripen-D on June 10 comes a crucial moment in Indian security planning. Just a few weeks before, when Saab unveiled the Gripen-E fighter, the significance was easy to miss. The new plane looks just like earlier versions, familiar for 30 years. But the extensive redesign is a major advance for the Swedish Air Force. It also represents the possibility for largest arms deal in Swedish history. In 1975, the “deal of the century” was General Dynamics’ sale of 348 F-16 fighters to four NATO members. At lot has changed in 40 years; planes cost more, air forces are smaller, and big arms deals are fewer. But Saab and its Gripen are a serious candidates for something comparable. If it succeeds, Swedish industry and diplomacy will be changed, and India’s security policy and diplomacy even more so. India has been evaluating the Gripen since 2007, originally as a candidate for a new medium fighter. The Gripen was too small for that role, and India chose France’s Rafale instead. This time the situation is very different, as India looks for a light fighter. But there are serious hurdles for both countries to overcome: economic, political and technological. A sale of 120 aircraft has a potential value of at least $12 billion (roughly SEK 100 billion). An order for as much as 200 aircraft is thought feasible. Even the smaller total would make this Sweden’s largest arms export since the Thirty Years War. A sale on this scale would ensure the viability of an industrial sector whose future otherwise looks increasingly marginal. It also would be a major test for the viability of Sweden’s revolutionary new arms export policy, with its unique democracy criterion. While competitors like Dassault, Eurofighter, and Sukhoi are free to sell to Middle East kingdoms, Swedish defense firms desperately need democratic clients. For India, much is at stake as well. 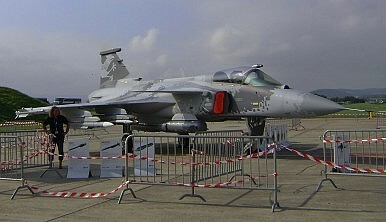 The Gripen is an appealing alternative to its domestic Tejas fighter, which is externally similar but poorly regarded. The Indian Air Force is buying limited numbers of the Tejas, but only under pressure from the government. Meanwhile it needs something to replace its fleet of 370 aging Soviet MiG-21s, its dominant light-weight fighter, from its preferred foreign supplier. For India, though, purchasing some 120 Gripen-Es would mean abandoning the national dream of an independent military aircraft industry. Despite 60 years of failure and disappointment, the commitment to self-sufficiency will be hard to give up. To leave that behind, Indian would insist on massive industrial offsets and technology transfers, making a Gripen deal the cynosure of an industrial and diplomatic relationship without precedent for Sweden. What that means for deals like this, though, is impossible to predict. “Make in India” emboldened expectations that foreign investors will be allowed to keep control over patents and rights. But the nationalist report of the Task Force led by V.K. Aatre, former scientific adviser to the defense minister, tacks in the opposite direction, recommending protection of Defense Public Sector Undertakings like aircraft-maker Hindustan Aeronautics. Jan Widerstrom, chairman of Saab India, sees this ambiguity as an opportunity. “Saab is not only looking at setting up a base here but also helping in the development of aerospace capability for many more years to come,” he said, as quoted by PTI. Widerstrom added that Saab will not simply move an assembly line but will build development capability: “We will design, develop, produce and maintain in India,” including technology transfers to improve Tejas or future projects. Saab, however, may be exaggerating its clout. Defense Minister Manohar Parrikar says the choice is wide open, with the Lockheed F-16, Boeing F/A-18, Dassault Rafale and Eurofighter Typhoon still serious alternatives. And public statements aside, more Russian MiG-29s cannot be excluded. More is involved than purely military, economic, or technological logic. Previous Gripen exports were relatively small and simple, but an agreement on this scale is beyond the firm’s resources. Selling the Gripen to India will require national commitment, including unprecedented promotion by the Swedish government. Swedish leaders seem to get that message. A large business and government visit to India in February, including Prime Minister Stefan Löfven, emphasized a range of prospects, but the Gripen clearly was top of the list. Saab Group CEO Håkan Buskhe and Saab aerospace chief Ulf Nilsson have been leading the effort, with direct support from Defense Minister Peter Hultqvist. A serious effort will require direct and sustained advocacy by the prime minister and foreign minister, too. But the right product and highest-level support are not necessarily enough. France discovered this while trying to sell its Rafale fighter. A much larger aircraft, the Rafale seemed well-suited to Indian requirements, and the Indian Air Force was enthusiastic after its other French fighters got strong reviews in the 1999 Kargil War with Pakistan. But even the extraordinary arms sale skills of the French were not enough. A 15 year campaign to sell the Rafael culminated in 2011 with a tentative agreement for 126 aircraft and major technology transfers. This gradually collapsed under the weight of Indian indecisiveness. In April 2015, Prime Minister Narendra Modi personally broke through the uncertainty with a commitment to buy 36 Rafales. This was followed a few months later with a reported decision to scrap the rest of the deal, although the French campaign goes on. Sweden’s “deal of the century” will require at least as much high-level engagement. This is not a classic Western arms deal where relationships are developed after the initial commitment. Relationships have to be created now, before the deal. It will require support by the government to demonstrate national commitment. This means investment in exchanges and routine visits to explicitly promote the Gripen and the virtues of a deeper bilateral relationship. Anything less leaves everything to chance and habit. For India, that usually means to buy Russian. Aaron Karp is Senior Lecturer at Old Dominion University in Norfolk, Virginia.